Florida Atlantic University’s College of Engineering and Computer Science selected six teaching assistants (TAs) to work with teachers in the science, technology, engineering and mathematics (STEM) Magnet classes at each of the Broward County Public School’s (BCPS) “Growing STEM” Magnet middle schools as part of a continuing partnership to help increase student achievement and create interest in STEM disciplines at the post-secondary level, as well as in a variety of STEM-related careers. 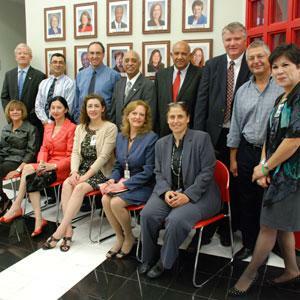 The School Board of Broward County recognized the FAU College of Engineering and Computer Science faculty and staff for their dedication and continuing support of the School Board of Broward County, Innovative Programs STEM Magnet middle schools at their district meeting on Wednesday, September 19. The “Growing Stem” project is funded by a grant awarded to the BCPS by the United States Department of Education through the Office of Innovation. Under the grant, in partnership with BCPS, FAU developed new curriculum suited for middle school students based on modules that include various captivating, rigorous, real-world and applied hands-on engineering activities and mini-projects. The six FAU engineering and computer science graduate students ─ Craig Ades, Adrian Desilva, Mike Horvak, Chris Nunes, David Pearson, Jessica Smith and Meba Solomon ─ will assist and support the BCPS math and science teachers in developing and conducting project-based learning activities and labs in line with the STEM curriculum. The program runs from September thru December 2012 for a total of 16 weeks at the participating middle schools ─ Apollo, McNicol, Parkway, Lauderhill, Margate and Silver Lakes. As part of the initiative FAU hosted a 2012 STEM Summer Teachers Academy to provide teachers with innovative instructional strategies that integrate key STEM foundational principles and processes and promote rigor through innovative thinking in order to create meaningful project-based learning experiences for students. FAU also designed and hosted a 2012 STEM Summer Student Academy, with challenging STEM project-based learning experiences for 300 students from the participating schools.